The entire experience was incredible. Located in the EEOB, we worked alongside employees from organizations like NASA, Google, and Github. Alongside these fellow developers, we spent June 1 hacking on the We the People API, building public, ready-to-launch applications, with the intention to make them available at the end of the day. Basic petition view shows the petition information, signatures, and a progress bar. Geographical view shows who signed the petition based on their location within the United States. Timeline view shows the petition’s progress, deadlines, and when it met signature milestones. Anyone who uses this view can choose between vertical or horizontal orientation. We focused on making this plugin extensible, so other developers can build additional petition views. Before showing up for the Hackathon, our team studied other plugins with similar concepts and began brainstorming and engineering our vision . Christopher focused on building in the timeline view, while Mo enhanced the embedding feature by using the same modal (pop up box) that publishers use to embed image and media. I focused on architecting a data center that would allow us to get the data we need as efficiently as possible. We received a great reaction from our fellow hackers, who were impressed with much we accomplished and how easy it is to extend our solution. You can find WP the People on GitHub. As it stands today, the visualizations (geographic and timeline view) require an intermediary server. We’re hoping to provide an intermediary solution, or at least a simplified version for release on the WordPress plug-in repository. Stay tuned! Open data is an important concept, especially in government. Encouraging the public to take part in events like this promotes openness and open source, while also encouraging creativity, innovation, and interaction. It’s great to see our government embracing these principles. 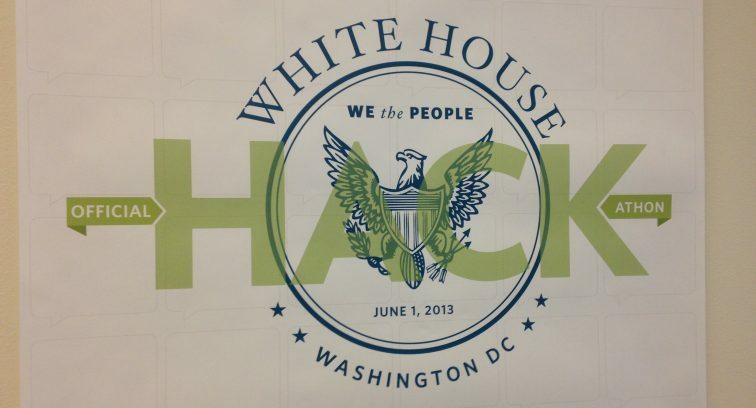 For more information on the White House Hackathon, check out We the People’s blog. For a list of some of the other apps created at the Hackathon, check out We the People’s API Gallery. For more technical information about our plugin, check out my recent blog post. And for more pictures of the Hackathon, check out our Facebook page!